Discover Your South America is a free online trip builder created by Surtrek, that allows you to customise South American tours according to your tastes, budget and interests. Have you ever wanted to be the creator of your very own tailor-made South American trip, family holiday or honeymoon? To take in the top highlights and unmissable, iconic destinations all at your own pace? With Discover Your South America, you can do just that! From adventures in Ecuador and the Galapagos, to Chile, Argentina and Peru; from Brazil, Colombia, Bolivia and Uruguay, to Paraguay and even Antarctica; we specialise in extraordinary experiences around South America that are personally tailored to you. Start by exploring your favourite destinations on the menu above, or keep scrolling to learn more. Using our in-depth expertise, we have compiled a bank of South America itineraries that you can customise at home. There’s everything from wildlife trips to romantic honeymoons, intrepid adventures to cultural tours, all of which can be created by you. Choose one of our itinerary ideas to get started, shaping your trip around a safe and recommended route. Then, handpick from a fantastic selection of hotels, activities and transfer options, adding or removing days in each destination as you see fit. Now you can produce your personal, once in a lifetime South American adventure! Find out more about how it works by clicking here, scroll down to explore our itinerary types, or contact us and speak to your travel specialist. 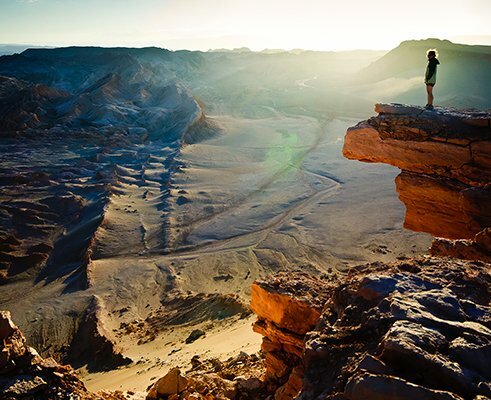 South America adventure holidays provide some of the most exhilarating experiences in the world, from hiking and biking to volcano climbing and desert 4x4 rides, accompanied by seriously jaw-dropping scenery. There is so much on offer in this incredible continent, including some of the world’s best travel experiences: think Machu Picchu, Iguazu Falls, the Galapagos and of course, the Amazon Rainforest. But on top of these great icons are so many more opportunities for adventure in South America you might not have heard of. Go ice-trekking on El Perito Moreno Glacier in Argentine Patagonia; bike down the dizzying, vertiginous slopes of Death Road in Bolivia; try horseback riding in the Ecuadorian Andes; and hike through Colombia’s Sierra Nevada to reach the crumbling ruins of The Lost City. Venture through the vast Pantanal Wetlands of Brazil on a safari; climb volcanoes in Chile’s Atacama Desert; or throw yourself into white-water rafting activities in Peru’s Sacred Valley. Whatever your fitness, ability, motivation and passion, if you’re looking for a world-class adventure, look no further than South America. Family holidays in South America are every bit a part of our DNA. We know the importance of learning new cultures first-hand, trying out exciting adventures together, and making memories to last a lifetime. Imagine the smile on your children’s faces when they tell their classmates that they explored lost temples hidden in the mountains of Peru, went stargazing in the moon-like deserts of Chile, or met Penguins in Patagonia? Few places in the world can also conjure excitement quite like the Amazon Rainforest. Mile upon mile of tropical trees, swinging Monkeys, Parrots, Piranhas and Crocodiles – it’s every child’s dream. There’s more wildlife to encounter in the Galapagos Islands, as well as deserted pirate coves and depleted volcanoes, and friendly locals to meet on the floating islands of Lake Titicaca, who lead an extraordinary life on the water. These are just a few of the many possibilities for family trips to South America – browse our template tours to start creating a unique holiday for you and yours. For the ultimate trip for two, South America honeymoons go above and beyond. If you and your fiancé like to do things a little bit differently – and want more to your trip of a lifetime than cocktails and sun loungers – South America is the place for you. How about a road trip to the Uyuni Salt Flats, where a world of shimmering white stretches far into the horizon? Or, marvel at Machu Picchu together, taking in this great Inca city that was once lost to the jungle? There’s wine tasting to savour in the central valleys of Chile or Argentina; dance shows (and classes) like tango in Buenos Aires and salsa in Cartagena. Then, pulsating party cities to soak up, such as Rio de Janeiro and visit Medellin in Colombia. Your South American honeymoon could wind up on exotic beaches of Colombia’s Tayrona National Park, Punta del Este in Uruguay and Buzios in Brazil, with fine food and dazzling views to boot. Whatever you want from your South America honeymoon, it promises to be unique, magical and perfect for the two of you. A symphony for the senses, South America cultural tours invite you to engage with the intangible magic of this extraordinary continent, its history, and its people. Ancient archaeology leaves traces of South America’s rich heritage: from Machu Picchu of the Inca civilisation to the Rapa Nui’s Moai statues on Easter Island; to name just a few. Thousands of years of history is evident in sites peppered across the continent, which simply have to be seen to be believed. Then there are the indigenous communities all over South America, from Amazon tribes to Lake Titicaca islanders, some of which you can meet and learn their way of life. A dizzying array of colonial towns are studded throughout South America too, with evidence of European-style architecture clear to see, from Salvador da Bahia’s pastel streets to Cusco’s carefully preserved monasteries, and many more. A culture tour in South America might incorporate dance classes, festivals and art galleries; market visits, wine tasting or cookery classes, for the chance to savour some of the tantalising flavours that showcase South America’s culinary prowess. After all, this vibrant, versatile continent is home to some of the finest food in the world. With its rich assortment of landscapes, environments and ecosystems, there are virtually endless possibilities for wildlife tours in South America. This remarkably biodiverse land flaunts the greatest rainforest in the world, the Amazon, which itself is made up of innumerable habitats that shelter hundreds of thousands of animal and insect species. Think Pink River Dolphins, Caiman crocs, Jaguars, Toucans, Monkeys and more, just some of the intriguing creatures that you can seek out on an Amazon wildlife safari. Then, who could forget the amazing Galapagos Islands, where endemic flora and fauna dwell and helped Charles Darwin to reach his theory of evolution. Encounter Blue-footed Boobies, Sea Lions, Galapagos Sharks and countless other special inhabitants of this natural wonder – it’s no cliché to say that the Galapagos is a true bucket list wildlife destination. All of this, before even mentioning the wildlife to witness in Brazil’s Pantanal Wetlands, Colombia’s Pacific Coast, the Valdes Peninsula of Argentina and even Chile’s Atacama Desert – among many more wildlife hotspots in South America. For an expedition into some of the world’s most staggering landscapes, a luxury South America cruise is just the ticket. 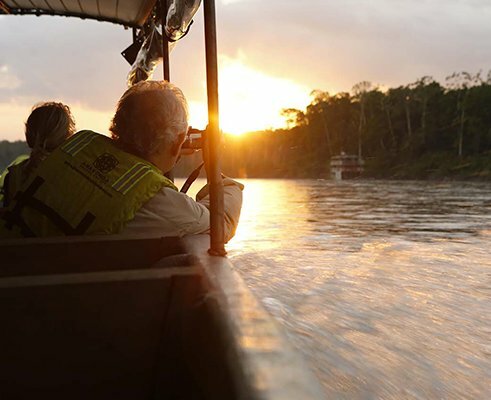 To witness South America’s awe-inspiring sceneries from the water is a thrilling experience, sailing on a luxury vessel in the company of naturalist guides who point out all the wonderful species around you. Perhaps the most intrepid journey of all is that which takes you to Antarctica, a world of pure white, untouched by humans given its extreme conditions and chilly embrace. Sail from Ushuaia in Argentina along Drake Passage, taking the route of yesteryear’s explorers like Cook, Amundsen and Scott, to reach this eerie but enchanting continent, shaped by craggy mountains, vast glaciers and icy waters, the home of spectacular animals like Whales and Penguins. Another destination for top wildlife cruises in South America is of course the Galapagos Archipelago, with the chance to sail various routes across different island groups and witnessing all manner of astonishing flora and fauna. There are so many highlights of South America that sometimes it is hard to know where to begin! That’s why we have put together some of the best Latin American tours, most iconic routes, must-see sites and cities all in one place. Infinitely impressive manmade structures exist across the continent, such as Peru’s Machu Picchu and the Nazca Lines, Christ the Redeemer in Rio de Janeiro, ornate churches in countless colonial towns, and floating reed islands on Lake Titicaca. Then, lush and green, dissected by age-old rivers, volcanoes and mountains alike, the natural wonders of South America await: the Amazon Rainforest, Galapagos Islands, Pantanal Wetlands, Atacama Desert, Uyuni Salt Flats and the picture-perfect Lake District which spans both Argentina and Chile. No matter what your perfect vacation looks like, whether it be a foodie tour, adventure trip or cultural highlights of South America holiday, we’ve provided some of the ultimate destinations to help get you started. If you’ve travelled to South America before, or are a first-time visitor but want a new and exciting experience, then there are countless ways to explore off the beaten track in South America. Picture lesser-visited countries that are simply begging to be discovered, such as Uruguay and Paraguay, which see many tourists from their neighbours but few from the rest of the world – making them well-kept travel secrets! With wineries, authentic cultures, colonial towns, beautiful national parks and glam beaches, there is so much to love about these little-known South American destinations. Or, you might want to experience the highlights of South America but in an entirely differently way, by taking alternative routes to popular sites (think of the Salkantay Trek to Machu Picchu) or hidden gems such as the archaeological ruins of Choquequirao, also in Peru. One thing’s for sure: being so vast and infinitely fascinating, you couldn’t possibly run out of places to venture off the well-trodden path in South America.